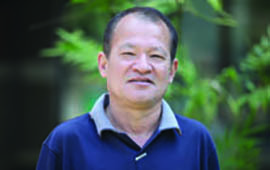 Samjwal Ratna Bajracharya, Remote Sensing Specialist at ICIMOD, was nominated for Prabal Janasewashree (IV) Award for his notable contribution to glacier research. The nomination was announced by the Ministry of Home Affairs, Government of Nepal on 30 May, Republic Day. He will be receiving the award from President Dr Ram Baran Yadav. Mr Bajracharya has been conducting research on glaciers since 1999 and has significantly contributed to generating knowledge about the status of glaciers in the Hindu Kush Himalayan region. He has also worked on assessing glacier change in Nepal and Bhutan. In 2014, he produced a seminal report on glaciers that used landstat data to reveal the current status of glaciers in Nepal and Bhutan and glacier change from 1980 to 2010. In recognition of this important work, he was invited to serve on the editorial board of the Journal of Mountain Science published by the Institute of Mountain Hazards and Environment (IMHE) at the Chinese Academy of Sciences (CAS).